Up first, though, is Nothing Man and the Purple Zero (Dancing Cat Books 2013), a young adult novel sure to please fans of Scarsbrook’s Cheeseburger Subversive and the White Pine Award-winning Monkeyface Chronicles. Nothing Man revisits Faireville District High School to introduce best friends Marty and Bill, whose lives are turned upside down when the accidental foiling of a robbery makes them overnight celebrities. The book is available September 1st, and will be launched at the Gladstone Hotel’s Melody Bar on Monday, September 16th. Full details of the launch, including RSVP information, are available below the cut. 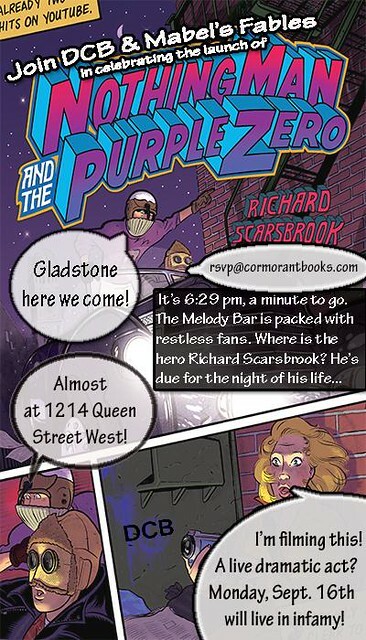 What: The launch of Richard Scarsbrook’s Nothing Man and the Purple Zero. When: Monday, September 16, 2013 at 6:30 p.m.
Where: Gladstone Hotel Melody Bar, 1214 Queen St. West, Toronto, ON.